Where there are mountains there are likely to be lakes – large or small. The Zermatt valley is a classic example, with a number of small lakes among the high mountains. Some are filled from glacial meltwater and are recently formed – the consequence of global warming and glacial retreat; others are simply in natural hollows that have probably been present for thousands of years. The Riffelsee, not far from the Gornergrat railway is an example of the latter. A pretty little lake in which, on a calm, day there is very often a reflection of the Matterhorn. Click here to view. 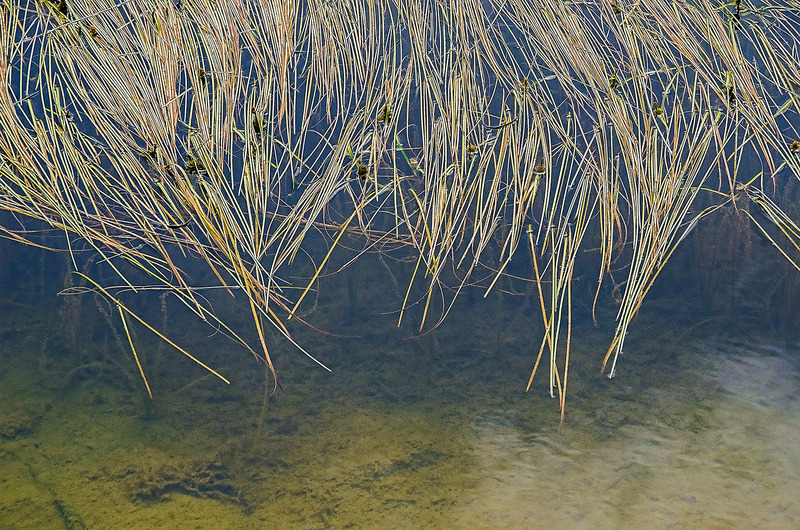 It is home to a lot of little fish, cotton grass and what I will call ‘water grass’. A more scientific term might be Reed. 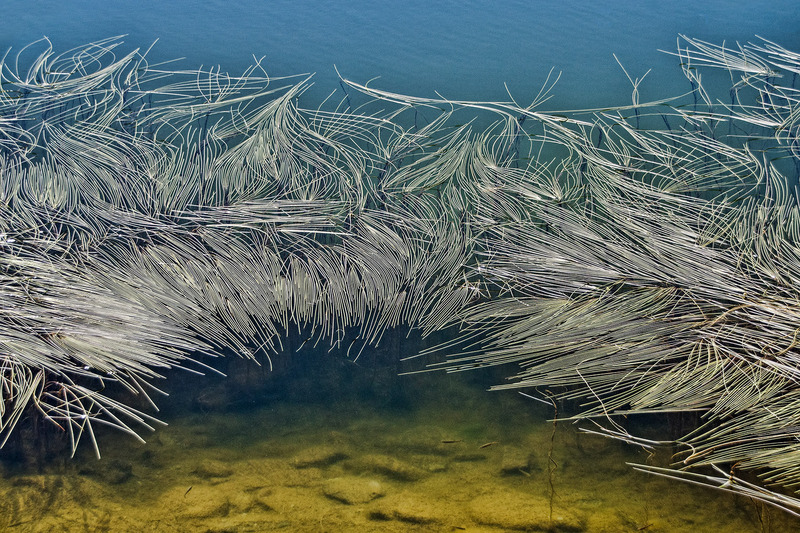 Found in clumps around the edge of the lake, the individual stems weave intricate patterns. The image above was shot two weeks ago, the one below in summer 2017. No scene is ever precisely the same. This entry was posted in Swiss Alps - Summer and tagged Gornergrat, Photography, Riffelsee, Water Grass. Bookmark the permalink. Reeds can be most photogenic! Beautiful shots, Andy. I love the colors and tones in these. The grass makes a great abstract subject. Thank you, Ken. The colours are very different this year – I think the grasses have become bleached by the sun. Beautiful, beautiful, Andy. I love the way the leaves are aligned, and I’m with Ken about the colors and tones. Thanks also for the link to your earlier photograph. I had forgotten it, but I’m relieved that I had originally Liked it. I still do. Your handling of the foreground to deep background is formidable! Glad you liked it. That goes back quite a few years! This place is one of my favourites. There’s a small rocky peak just to the left of the little lake where I rock climbed for the first time with a Swiss Mountain Guide in 1962. A few years ago I took my son and a friend of his up the same rock route and we abseiled off the top. A great memory. Thank you Linda. A bit of wind and a storm will re-align them… There were more grasses this year than last, and the colours were paler – possibly due to the greater exposure to sun and heat this summer. They’re wonderful abstractions. They seem to have as much flow to them as grasses do. If the silvery gray stems are reeds, they seem to have as much flow to them as grasses do. I find the color as appealing as the arrangement, actually. It’s quite different from anything I’ve seen here. Thanks Linda. I don’t think I’ve seen anything quite like this elsewhere. Hopefully I will be back there again and I will look for the same grasses again. Just completely amazing, full of life and movement, beautifully shot too. Thanks Paula. This year I shot more towards the sun, and I think the grasses were more widespread around the edges of this little lake. I hesitate to use the word unique, but I haven’t seem anything quite like this elsewhere.